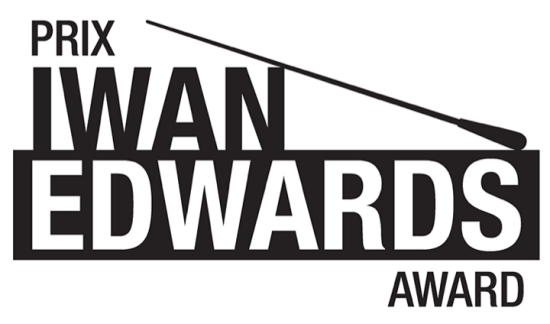 The St. Lawrence Choir created the Iwan Edwards Award in recognition of its founder's prodigious contribution and commitment of nearly fifty years to choral music in Canada. Maestro Edwards is a respected teacher and mentor besides being a talented choral conductor and musician. The award established in his name therefore provides a scholarship for young conductors in keeping with the support that he has given to so many people over the years. The St. Lawrence Choir is honoured to have granted this annual award since 2011. Each year, the recipient is selected from among the Canadian conductors enrolled in the Montreal Choral Institute's Masterclass or the Association of Canadian Choral Communities' workshop. Past recipients have been Rob Curtis (2011), Claire Mallin (2012), Melissa Morgan (2013), Liska Jetchick (2014), Virginie Pacheco (2015), and Thomas Burton (2016). In March 2018, the Montreal Choral Institute will once again be offering its annual three-day intensive workshop on choral conducting. Six conductors selected from among all applicants will work individually with some top-notch Montreal choirs under the guidance of internationally renowned conductor Andrew Megill. The participating conductors will be advised at the beginning of the masterclass of the location where these sessions will take place. Applicants selected for active participation will be informed of the Institute’s decision on January 12, 2018. One of the participants from Canada will receive the $500 Iwan Edwards Award (see sidebar for more details). If you have any questions, please send an email to the address indicated above. Auditors will be invited to attend the sessions with choir and to take part in a group session held specifically for them. Please note that participants are responsible for all travel, accommodation and incidental expenses. The Institute can, however, provide assistance in finding accommodation and reasonably priced meals. Members of the public have access to all sessions with choir (see schedule above). Admission is free, but free-will offerings are welcome.